AiF Upload is an online shorts festival inviting AiF members to share their original works through the world’s largest creative digital community — Instagram! We encourage shorts across all genres to be considered for submissions including animation, comedy, drama, action and documentary. A selection of 10 shorts will be hand-picked by AiF and uploaded to AiF’s IGTV for one week. AiF will announce the best of the bunch titled, Jury Prize, followed by Fan Favourite - the short that gained the most Instagram likes/views a week later. The maximum duration for each short film is to be no longer than ten (10) minutes, including credits. Applicants must submit either a link to a high-resolution video no larger than 4096 x 2160 pixels on YouTube or Vimeo, or if uploading to cloud storage, a video file in Quicktime (.mov) or MPEG (.mpg, .mpeg, .mp4). 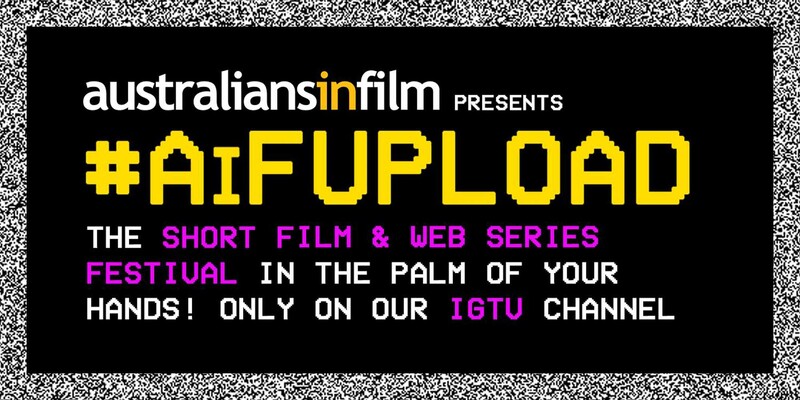 Please ensure there is no password and sharing settings are enabled for AiF to download your short film. Download IGTV from the App Store or Google Play Store. Submissions open on Monday July 23 at 10:00AM (PST) / Tuesday July 24 at 3:00PM (AEST). Deadline for submission is Monday 6 August at 11:59AM (PST) / Tuesday August 7 4:59AM (AEST). Finalists will be announced throughout August 13th - 15th and prize winners announced on Friday August 24 (USA), Saturday August 25 (Australia). ONLY current AiF members are eligible to submit. Membership will be checked. Submit your 10-minute-or-less film using WuFoo.com and agree to AiF’s terms. The short film will be publicly available on AiF’s IGTV account until Friday October 26, 2018. Do I need an Instagram account to submit my short? At this stage, we can only accept one film per submission. That’s totally okay, just include their name/s and Instagram handle in your submission form. Of course. However, please subtitle your film in English if the spoken language is not English. Films in a different language other than English and not subtitled in English will not be considered for the festival. I have a question about film rights and ownership? We encourage all members to read our terms in the submission form on WuFoo.com or on our Terms page. No, your short film must be the final cut and cannot be altered after submission. What if my short film contains explicit content? All submissions must follow Instagram’s Community Guidelines. How long will my short film be up on IGTV? We have a team of super-smart chimps who can crunch this data – by dividing each short film’s Instagram Likes by the number of Video Views. Therefore, the short film with the highest Likes-to-Views ratio will be selected to receive the Fan Favourite Award! email AiF at membership@australiansinfilm.org or DM us on Instagram! the Submitting Parties have the full right, power and authority to submit the Film to AiF for Shorts Festival consideration, and to grant all of the rights granted hereunder and in the registration form, and there is no obligation or disability which would in any way impair, restrict or impede the Submitting Parties from fully performing all obligations pursuant to the submission and these Terms. The Submitting Parties agree to indemnify and hold harmless AiF, its licensees, successors and assigns, and its and their members, officers, directors, employees, agents, representatives, associates and affiliates (each, a “Releasee”), from any claim, suit, action or other proceeding brought against a Releasee and from any losses, costs, or damages, including the Releasee’s full legal costs, which it may have suffered or incurred or may suffer or incur, directly or indirectly based on, in connection with, or arising from the use and Shorts Festival of the Film submitted by the Applicant or the breach or alleged breach of any representation, warranty or other agreement made by the Applicant in these Terms. By submitting an Film to AiF, the Submitting Parties hereby release AiF from any and all liability in the event of theft, unauthorized access or copying, or any breach of copyright of the submitted Film while it is in AiF’s possession. By submitting the film to AiF, the Submitting Parties hereby grant AiF, its successors, assigns and licensees a non-exclusive irrevocable, royalty-free license to incorporate, use and reproduce the Film in whole or in part, in any manner and in all languages, editions, derivations, formats and media, whether now known or hereinafter devised in all territories throughout the world, in perpetuity for various purposes in connection with and promotion of the Shorts Festival, AiF’s charitable mandate and in connection with the activities and ancillary products of AiF, its affiliates, partners, and sponsors. The Submitting Parties hereby waive in favour of AiF and its successors, assigns and licensees all moral rights of whatsoever nature in and to the Film and any right to inspect and/or approve any advertising or promotional materials that may be used in connection with its use by AiF as expressly permitted hereunder.